This blog is mainly designed for all the technology related information.Here you will find the ways to earn money online like how to start a blog,how start a youtube channel and many more ways.Here you will also find the information about the latest Android phones,gadgets,computers,games,sotfwares,apps,latest tech news. How to change gmail password. Hello Guys welcome back to the website. So today we going to discuss about how you can change gmail password. So we are going to help you step by step. So lets get started. Open any browser on your phone. Example if you are having chrome browser , Opera browser, uc Browser or any kind of other browser like puffin etc. Head on to search bar and type google account. After searching the keyword you will get many results. Click on the second or it may be third link which would be like as Sign In-Google Accounts. After clicking on the link you will have to put your email id or simply your gmail id and press Next. After that you will have to enter the password which you are currently using to sign and then press the sign in. And you will be logged into your google account. Now slide the options on the top as you can see in the picture below. Now click on the 4th option i.e security and enter your old password again. Now in the next window you will have to enter the New Password which you want to make your new password. Confirm the password by typing it again in the next box and click on the Change Password. Great..! Your password is changed now. If you are doing the process on the android phone you will get a notification from google named as Action Required. Scroll Down the notification bar and click on the notification. After waiting for few seconds you will see a box showing enter your password on the top of it. Enter your New Password which we have recently set in the above process. 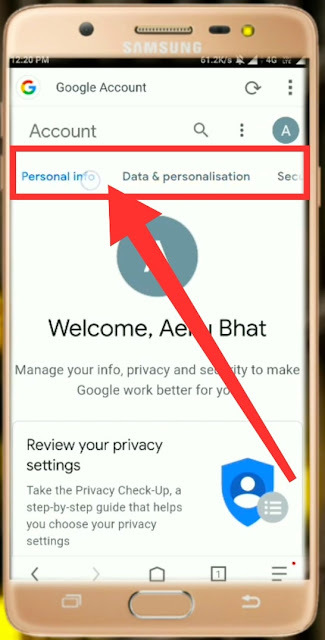 Now you will be logged into your google account. So this was How to change gmail password hope you guys enjoy it..! If you have any questions or queries related to the topic just comment below and we will answer it. If you have any suggestions please feel free to suggest. And if you want any information related to any other topic comment below and we will post here as soon as as possible. You can directly watch a video on it shown below and don't forget to subscribe our channel.